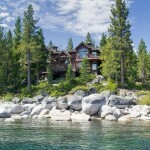 Congratulations to our clients who just purchased this breathtaking lakefront A-Frame cabin. The cabin is surrounded by the clear blue waters of Lake Dulzura at Serene Lakes. Located on a quiet cul-de-sac, this lakefront property is the ultimate place to relax and enjoy your time in the mountains. Plus the added benefit of paddleboarding right out of your backyard. There is so much to love in this breathtaking property including beautiful lake and mountain views, a floating dock, massive granite fireplace in the spacious great room, game loft, lakeside hot tub, and more. Chock-full of charm, this cabin features a fully remodeled kitchen and great room that was featured in Sunset Magazine – “Tahoe Cabin Makeover“. There will be no shortage of memories created in this classic Serene Lakes lakefront cabin. Located off I-80 on Donner Summit, Serene Lakes offers a beautiful respite from city life. 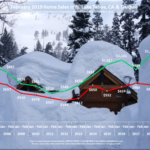 Known for offering wholesome family fun, people have been heading to Donner Summit and Serene Lakes for over a hundred years to recharge their batteries and get back to a more simple lifestyle. 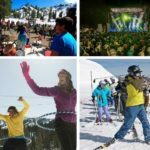 This majestic region of the Sierra Nevada is known for deep snow and top-notch skiing at a handful of great resorts such as Sugarbowl, Boreal, Royal Gorge, and Donner Ski Ranch. During the summer months, you will find people out and about enjoying the expansive network of hiking and mountain biking trails, kayaking, paddleboarding, and enjoying nature. This neighborhood is perfect for anyone looking to get off the beaten path and enjoy the mountains in their most pure form.